The County of Los Angeles administers the Southern California Regional Energy Network (SoCalREN) to bring together a wide variety of services with one common goal: achieving unprecedented levels of energy savings throughout Southern California. 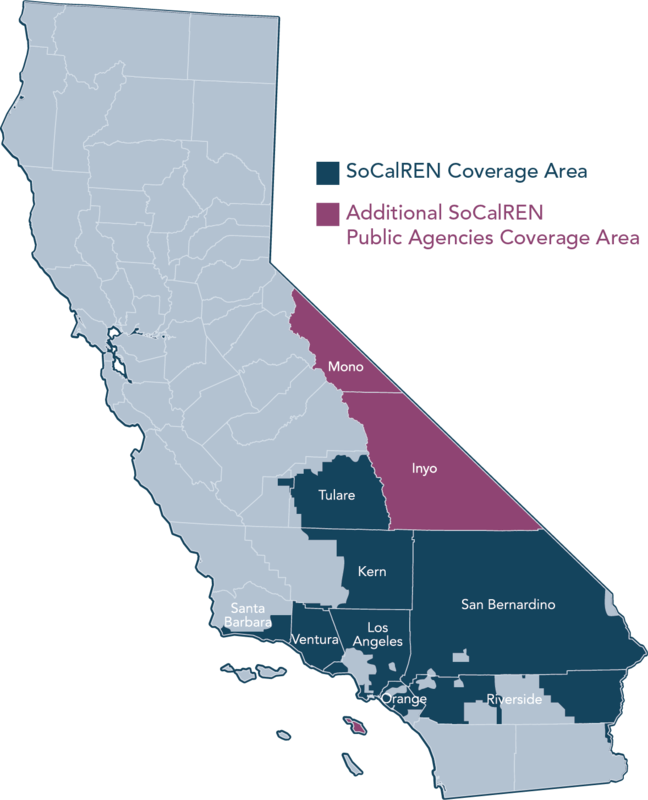 Authorized in 2012 by the California Public Utilities Commission (CPUC), the SoCalREN provides services to residents, businesses, and public agencies throughout the areas served by Southern California Edison (SCE) and SoCalGas®. Through the design and implementation of programs that impact homes, businesses, and public facilities, the SoCalREN has helped reduce energy use throughout the region. From helping a multifamily property owner make improvements to tenant units, to guiding cities through the process of upgrading street lighting to increase energy efficiency and safety, the services provided by the SoCalREN are making a difference. In addition, the SoCalREN leads initiatives that help cities track energy use, help Minority and Disadvantaged Business Enterprises obtain employment training, and more. To learn more about the SoCalREN, please read the 2017 Annual Report. You may also contact the SoCalREN team for additional information about current and future offerings and opportunities. Over its lifetime, efficient street lighting installed in the City of Long Beach with the assistance of the SoCalREN Public Agency Program will help save the city up to $15 Million in energy costs. The SoCalREN’s Workforce Development Program helped nearly 350 students gain access to education through the Architecture Construction Engineering Students (ACES) program. ACES students earned more than $74,000 internship dollars during 2017. Santa Monica residents are enjoying brighter, more efficient LED lighting at the Big Blue Bus facility and the Santa Monica Swim Center. These are just two of the projects the City completed with the assistance of the SoCalREN Public Agency Program. Through the SoCalREN Multifamily Program, nearly 7,400 residential multifamily units have been improved with energy efficiency measures that help tenants save energy and enjoy a healthier indoor living environment. The SoCalREN team is here to answer your questions and provide support. Provide your information below, and a program representative will contact you. Professionalism of consultants and SoCalREN Public Agency Program staff has been high. The program is more hands on and personal than other programs we have used before. SoCalREN has done a wonderful job and we both have learned a lot since we began working together. We are happy to be part of a collaborative partnership to save energy and the environment through the SoCalREN Public Agency Program. With the SoCalREN Public Agency Program, we are able to do things that would not have been done otherwise. Technical expertise has been a huge help. It has been great working with everyone in the SoCalREN Public Agency Program! I can truly say we would have not gotten this far this fast in such a cost-effective manner without SoCalREN’s guidance and technical assistance every step of the way. In short, the SoCalREN Public Agency Program is a fantastic program to assist local governments in energy efficiency that will pay dividends for years to come. Their level of expertise and professionalism has been unsurpassed. They have suggested things that we never thought of, and weren’t even on our radar. They have done significant amounts of work on our behalf that has resulted in substantial savings of both energy and money. It’s a great project for Whittier. It’s green and it helps us save energy. We’re getting a lot of bang for our buck. It’s win-win-win all the way around. The SoCalREN Public Agency Program provided engineering services, project management, and the resources needed to streamline the Cucamonga Valley Water District’s energy efficiency projects from start to finish.